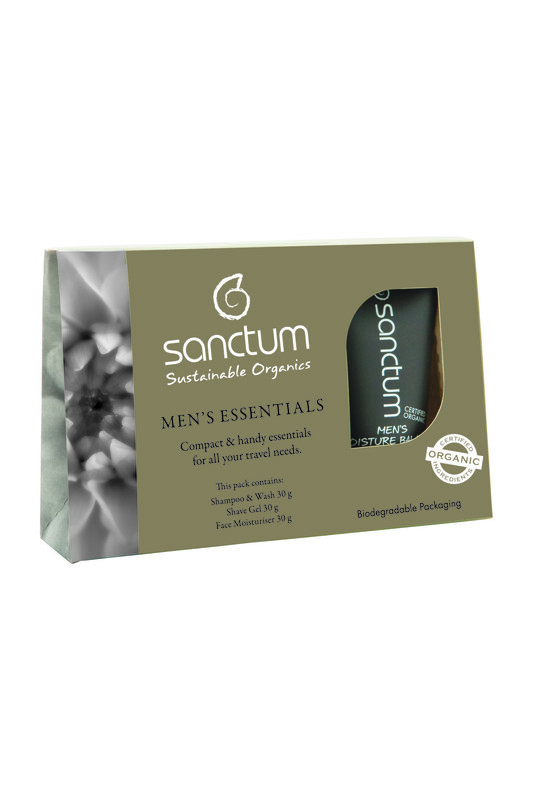 Description: Sanctum Organic Men's Essentials Travel Pack containing: 1 x Sanctum Organic Men's Shampoo & Shower Wash (30ml), 1 x Sanctum Organic Men's Shaving Gel (30ml), 1 x Sanctum Organic Men's Facial Moisturiser (30ml). 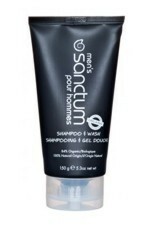 This smaller pack, designed for travel, is also a perfect way for new customers to test Sanctum Men's product range. Description: Certified Organic 84% and 100% Naturally Derived. A woody scented soap-free hair and body cleanser. 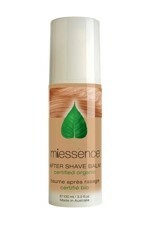 This minimum fuss shower gel is gentle enough to use daily and foams up with water. 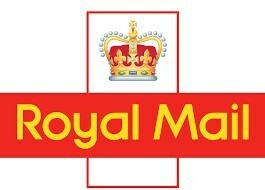 Ideal for: All men and used on a daily basis. How does it work? : To be used in the shower or bath, the soothing wash removes daily dirt and grime, whilst leaving the body with a long lasting masculine woody scent. How to use: Daily. In the bath or shower as an alternative to soap and shampoo. Rinse off thoroughly. Olive Leaf Extract* - Nourishing and calming to the skin, the extract is believed to have cell-regenerative capabilities. The extract also provides a stable base to the wash.
Decyl Glucoside - Sugar cane derived cleanser. 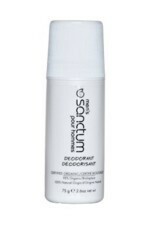 An extremely mild natural cleansing agent that is derived from sugar cane. It leaves the skin and hair clean and soft. Aloe barbadensis Leaf Juice*, Decyl Glucoside, Sodium Lauroyl Sarcosinate, Olive (Olea europaea) Leaf Extract*, Aqua, Glycerin*, Xanthan Gum, Guar (Cyamopsis tetragonoloba) Gum, Jojoba (Simmondsia chinensis) Seed Oil*, Hydrolyzed Soy Protein, Honeysuckle (Lonicera caprifolium) Flower Extract, Honeysuckle (Lonicera japonica) Flower Extract, Cedarwood (Cedrus atlantica) Bark Oil, Lavender (Lavandula angustifolia) Oil*, Bergamot (Citrus aurantium bergamia) Oil*, Patchouli (Pogostemon cablin) Oil, Geranium maculatum Oil, Sandalwood (Santalum album) Oil, Linalool, Limonene. Description: Certified Organic 95% and 100% Naturally Derived. This soap-free shave gel is designed to lift the hairs on the face to achieve a closer shave. It prevents shaving nicks as the lathering motion separates the hair from the skin. 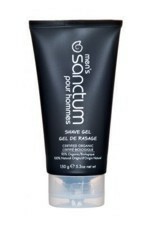 The gel also has soothing and hydrating properties. Ideal for: Use on a daily basis. How does it work? : Once the face is dampened the hydrating gel should be lathered and left for 20 seconds so the hair on the face softens through the product. How to use: Daily. Shave with the direction of hair growth. Rinse face thoroughly upon completion, follow with the Men’s Face Moisturiser. Aloe Vera Leaf Juice* - Anti-inflammatory, soothing, hydrating and toning. Jojoba Oil* - Closely resembles skin’s natural oils; contains protein and minerals; to soothe, soften, nourish and protect. Cedarwood Bark Oil - The oil provides a base note, a woody aroma, as well as antibacterial properties. Aloe barbadensis Leaf Juice*, Sodium Lauroyl Sarcosinate, Olive (Olea europaea) Leaf Extract*, Sodium Palmate*, Aqua, Glycerin*, Jojoba (Simmondsia chinensis) Seed Oil*, Xanthan Gum, Guar (Cyamopsis tetragonoloba) Gum, Honeysuckle (Lonicera caprifolium) Flower Extract, Honeysuckle (Lonicera japonica) Flower Extract, Cedarwood (Cedrus atlantica) Bark Oil, Lavender (Lavandula angustifolia) Oil*, Bergamot (Citrus aurantium bergamia) Oil*, Patchouli (Pogostemon cablin) Oil, Geranium maculatum Oil, Sandalwood (Santalum album) Oil, Limonene, Linalool. Description: Certified Organic 99% and 100% Naturally Derived. This facial moisturiser is formulated to calm and soothe irritated skin, leaving it feeling cool and hydrated. 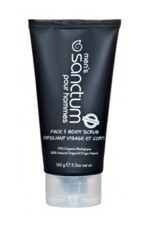 Ideal for: All men, especially those concerned with premature ageing and reducing oiliness. How does it work? 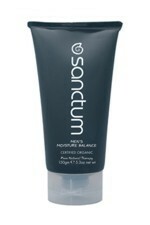 : The gel based product is designed to maintain the skin’s natural pH, whilst aiding in hydrating and preventing oiliness. How to use: Use each morning and night after cleansing and/or shaving. Apply a small amount over face and neck. Witch Hazel Extract* - Anti-inflammatory with astringent properties. Softens and soothes. Oak Bark Extract* - Astringent. 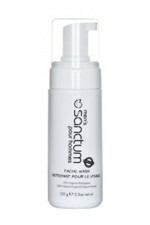 Helps regenerate damaged skin tissue. Regulates skin tone and colour. Sandalwood Oil - The oil provides a base note, a woody aroma, as well as antibacterial properties. Aloe barbadensis Leaf Juice*, Olive (Olea europaea) Leaf Extract*, Glycerin*, Sodium Magnesium Silicate, Aqua, Xanthan Gum, Honeysuckle (Lonicera caprifolium) Flower Extract, Chamomile (Chamomilla recutita matricaria) Flower Extract*, Honeysuckle (Lonicera japonica) Flower Extract, Witch Hazel (Hamamelis virginiana) Extract*, Sodium PCA, Oak (Quercus robur) Bark Extract*, Cedarwood (Cedrus atlantica) Bark Oil, Lavender (Lavandula angustifolia) Oil*, Bergamot (Citrus aurantium bergamia) Oil*, Patchouli (Pogostemon cablin) Oil, Geranium maculatum Oil, Sandalwood (Santalum album) Oil, Limonene, Linalool.